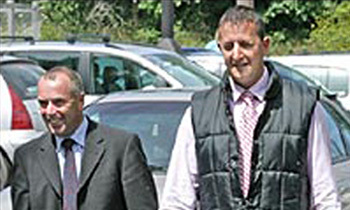 Two men have been found guilty of illegally hunting deer with hounds. Huntsman Richard Down, 44, and whipper-in Adrian Pillivant, 36 of the Quantock Staghounds were convicted at Bristol Magistrates’ Court. Anti-hunt campaigners filmed two hounds chasing deer on Exmoor. The League Against Cruel Sports (LACS) said the deer were chased for more than an hour. Both men had denied contravening the Hunting Act, which came into force in February 2005. The LACS said it launched the prosecution because no attempt was made to shoot the deer humanely or call off the hounds during the hunt. Spokesman Douglas Batchelor, said: “Justice has prevailed today (Thursday) in what was a clear-cut case of blatant law-breaking by hunters who believe themselves to be above the law. “The hunting fraternity must grasp what the British public have understood ever since the ban was introduced – chasing and slaughtering stags for pleasure is totally unacceptable in a civilised society. Down, 44, of Bagborough, Somerset, and Pillivant, 36, of Willand, Devon had argued throughout the trial that they had been hunting the deer within the law. District Judge David Parsons said their argument was “disingenuous” and fined both men £500 and ordered them to pay £1,000 each as a contribution towards costs. He said: “Neither defendant has established on the balance of probability that he reasonably believed the hunting was exempt. The LACS had played the court video evidence of 20 deer being chased with dogs at a hunt meet at Longstone Hill, Somerset, last February. Richard Furlong, representing the League, had told the court: “They made no attempt to call the dogs off. “The facts of this case are that no reasonable person could have believed this was exempt from the Hunting Act. Robbie Marsland, UK director of the International Fund for Animal Welfare (IFAW), welcomed the decision. He said: “This is the second time that the league has taken and won a private prosecution and IFAW congratulates them for that. “In the light of this ruling it is very difficult to see how anyone could go out stag hunting in the belief that they are acting lawfully.